In my experiences of working in retail, I’ve been pretty fortunate in regards to sexism. 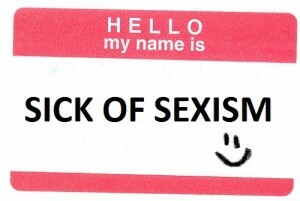 Apart from a few stand-out occurrences, most of my working retail life has been sexism-free, at least on the surface. However, the few times when I have been made to feel uncomfortable – because I happen to identify as female – have been enough to change how I deal not only with male customers but also men in general. I’ve been at my current job, a newsagency that also sells TattsLotto, since before my “feminist awakening”. This can be seen through my responses to two similar experiences, one from when I first started working there and the second from quite recently. One day, I gave a man his TattsLotto tickets and then asked him the standard line of ‘Can I get you anything else?’ with my perfectly-sunny-retail-smile. He responded, ‘How about a kiss?’ I laughed and said, ‘Sorry, sir, this isn’t that kind of place.’ I may have been naive, but at least I was sassy. However, since then I have woken up to the discrimination all around me and become a feminist. This has changed how I respond to sexism, such as a recent incident. Same situation, same retail-line, but this time I wasn’t going to take sexism lying down. When the man on the other side of the counter replied, ‘When you said, “Can I get you anything else?” and smiled, I thought, “Come here”’, and leaned forward while leering creepily, I felt the smile slip off my face. I became incredibly uncomfortable and looked away. Unhappy that I didn’t react, he invaded my line of vision again and demanded that I do what women are supposed to do when made to feel uncomfortable: ‘smile’. I looked him straight in the eye and said, ‘No, that wasn’t funny, I’m not going to smile.’ I am offering you a service, but not that kind of service. Just because I’m selling you lottery tickets doesn’t mean you’re going to get lucky. As my workplace sells magazines as well, I also have to deal with men buying pornographic magazines. While I certainly don’t believe in restricting what people can read, I also don’t particularly want to ‘support the legitimisation of sexist attitudes and behaviours’, which is what researchers from Surrey found occurred in so-called lads’ mags (for a deeper explanation of the study’s findings, read the article on the University of Surrey’s website). Every time I sell one of these magazines, I wonder what the male customer thinks of me. Do they see me like one of those girls in the magazine? Do they view me as some sort of object for their sexual pleasure? This isn’t even mentioning the time I accidentally helped one of these men sext his girlfriend (don’t even ask; let’s just say I can never think of the word ‘melting’ in the same way again). Unfortunately, they are one of our most popular magazine categories, so it’s not likely that we will stop selling them any time soon. Sarah Randall has recently completed a Bachelor of Arts (Professional and Creative Writing). She is now writing an Honours thesis on gender roles in fairytales, which allows her to rip her favourite films to shreds. Sarah has previously been published in Imagine. This entry was posted in Featured, Life, Opinion, Uncategorised and tagged customer service, feminism, feminist, newsagency, retail, self-respect, sexism. Bookmark the permalink.